Venus Williams, of the United States, left, greets Sara Errani, of Italy, at the net after Errani won their third round match of the 2014 U.S. Open tennis tournament, Friday, Aug. 29, 2014, in New York. A day before facing Venus Williams — and a partisan crowd — at the U.S. Open, Italy's Sara Errani came across a video posted on Twitter that gave her a little extra motivation. It showed a pair of former players and coaches, Brad Gilbert and Darren Cahill, forecasting Friday at Flushing Meadows. Both picked Williams to win. The 13th-seeded Errani's ears perked up particularly when Gilbert referred to her "cottage cheese" serve and predicted she'd win only four games. So much for that. In a riveting third-round match of wild momentum swings, the 19th-seeded Williams, a two-time U.S. Open champion, came within two points of victory four times before succumbing to Errani 6-0, 0-6, 7-6 (5). As if needing a reminder of what she'd seen online, Errani was interviewed for TV by Cahill before the match, and by Gilbert afterward. "Let's just say that during the match I thought about that (video) more than once," said Errani, who pounded her chest with a fist and put a finger to her lips on court as if to hush doubters — or the loud folks in Arthur Ashe Stadium pulling for her American opponent. Williams is 34, dealing with an autoimmune disease, and hasn't been to the fourth round at a major since 2011. She also played a doubles match Thursday with her sister Serena that lasted about 2 1/2 hours and finished shortly before 8 p.m.
"I guess the schedule definitely wasn't ideal," Williams said. "It was just such a late match." After losing to Errani, Williams went on court again for doubles and won that one, although she was treated by a trainer. Williams did not blame injury or fatigue for the way she failed to close out Errani, including getting broken while serving at 5-3 in the third. "I went for too much," explained Williams, 3-0 against Errani until Friday. 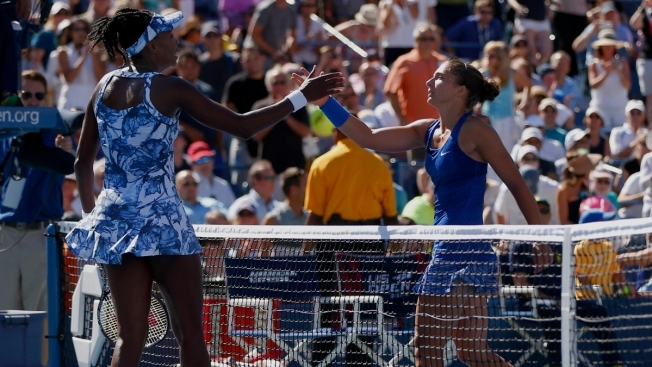 "She just played one of the best matches of her life," Williams added. Errani is listed at 5-foot-4 1/2 — 8 1/2 inches shorter than Williams — and truly, there is just as big a disparity in their serving. Errani's top speed Friday was 88 mph, about 30 mph slower than Williams. Errani's second serves were in the low 60s mph, but she got 86 percent of her first serves in. "I know (people) say my serve is terrible, but it helped me get to where I've been," Errani said. "It's not easy to improve it. It's definitely one of my weak points, but today it helped me." Her next opponent will be another surprise winner: 32-year-old qualifier Mirjana Lucic-Baroni of Croatia, who eliminated No. 2-seeded Simona Halep of Romania 7-6 (6), 6-2. Lucic-Baroni hadn't reached the fourth round at a major since getting to Wimbledon's semifinals in 1999. "I feel," she said, "like a little kid; like this is the first time ever." Half of the top eight seeded women already are out, with Halep joining No. 6 Angelique Kerber (beaten 6-1, 7-5 Friday by 17-year-old Belinda Bencic of Switzerland), and earlier losers No. 4 Agnieszka Radwanska and No. 8 Ana Ivanovic. No. 5 Maria Sharapova, a five-time major champion, avoided that sort of upset by beating 2013 Wimbledon runner-up Sabine Lisicki 6-2, 6-4 in a match that ended after midnight. Sharapova trailed 3-1 in the second set, but took five of the last six games after Lisicki was told by chair umpire Carlos Ramos that he thought she was receiving coaching help, which isn't allowed during Grand Slam matches. The men's draw, in contrast, has gone pretty much to form. No. 2 Roger Federer's 6-4, 6-4, 6-4 victory over Australia's Sam Groth at night closed the second round with only two top-20 men departed: No. 11 Ernests Gulbis and No. 15 Fabio Fognini, both eliminated Friday. Halep, the French Open runner-up and Wimbledon semifinalist, had three set points in the first while ahead 5-2, before collapsing. When that lead slipped away, Halep said, "I wasn't in a good mood." Williams wound up with 52 unforced errors, more than twice as many as Errani. A terrible start hurt, too: It was the sixth time in her 276 Grand Slam matches that Williams lost a set at love. Of the five other women to shut her out in a set at a major — Martina Hingis at the 1997 U.S. Open, Lindsay Davenport at the 1999 Australian Open, Arantxa Sanchez Vicario at the 2000 French Open, Agnes Szavay at the 2009 French Open, and Kim Clijsters at the 2009 U.S. Open — four won multiple Grand Slam singles titles. Errani has yet to win one, but she is hardly unaccomplished. In singles, she reached the French Open final and U.S. Open semifinals in 2012, and the French Open semifinals last year. She is even better at doubles, completing a career Grand Slam with Roberta Vinci at Wimbledon last month, and the volleying skills she's developed in that event were on full display against Williams. None was better than the backhand volley in a 27-stroke exchange at 5-all in the tiebreaker. "Absurd. A bit lucky, but absurd," Errani said. "Even my coach said he thought I was going to lose that point."